An extremely comfortable and sophisticated vessel, inspired by the great Italian ocean liners of the past. Everything about her is dazzling, enchanting and entertaining. The buffet restaurant pays tribute to Christopher Columbus as it looks out around two pool decks. The stern pool can be enjoyed in all weather with its retractable glass roof, the other, will astonish you with its exceptional space and design. As if all that weren't enough, the sauna and steam rooms have fantastic views looking out to sea. 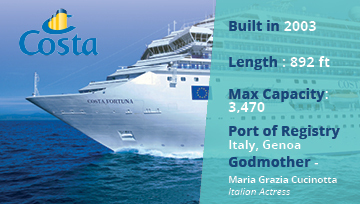 Costa Fortuna has four delightful restaurants, giving guests the chance to explore different onboard dining options. Costa, with its Italian heritage, incorporates a range of European inspired food taking guests around Europe even with the cuisine alone. Cristoforo Colombo is a buffet restaurant with a range of different specialties; a great restaurant to take the kids. The buffet serves breakfast, lunch, and dinner. The Club is a divine a la carte restaurant with a great ambience; it’s a lovely choice for dinner, but you’ll need to book it in advance. The Club only serves from 19.00 until 21.30, and offers a private lounge located on the top deck, for you and your loved ones to relax in. Michelangelo is an elegant restaurant with a large stylish room and a fantastic model of the ship name at the entrance. The food here is inspired by the sea, with a range of seafood and meat dishes on the menu. The restaurant is open from breakfast, lunch, and dinner. Raffaello is a chic restaurant with formal dining offering fixed timing, at 18.30 or 21.00 for dinner. The restaurant is only open in the evenings and specialises in meat and fish. A great place to grab a bite during the day is the Burger Grill, located by the pool. There’s nothing that a burger and fries can’t fix, it’s a great alternative for all the family, a quick and easy option. Costa Cruises has devoted themselves to creating unforgettable onboard experiences with their stylish entertainment venues, and over 13 bars allowing for a variety of options. A popular spot onboard is the Rex Theatre. It’s a fantastic venue with three levels and a great atmosphere, and offers a range of production shows, parties, and events; it’s the place to be on board. The Discoteca Vulcania is an exciting club with a colourful and bold atmosphere, with its extensive bar it’s a fantastic place to get some drinks in and dance! A venue with a similar energy is Casino Neptunia - a Vegas inspired casino with slot machines, poker, and so much more. Or there’s Mondo Virtuale, a games room which is great for any ages, with a range of video games, board games, and cards. Children’s club Squok allows children to have just as much fun as the adults with a variety of different activities every day. There are pool parties and a complete room full of videogames. Guests are able to completely relax onboard Fortuna with four pools and five Jacuzzis to choose from. For fitness there is a tennis court, and a running track. There is also a large gym equipped with all the latest equipment. Treat yourself with the Terme Saturnia spa with an after gym sauna or steam. If you want a further treatment enjoy Venus Beauty suite, which has a hair and beauty salon. Fortuna also has essentials facilities such as laundry and ironing, there is a library alongside the internet café. There is also a fun family card room, and an epic Squok mini club. A medical centre and an exciting shopping centre. The cruise was ok and value for money it was obvious to us having been on that ship before they are making lots of cuts and it shows. Will not be sailing on Costa again they have cheapened the brand . Just finished our 7 days cruise yesterday, it was a good experience and everything was very well organized. Crew from all levels and positions were helpful and friendly. Foods were good and delicious, but sausage & salami all was pork which we as Muslims, could not use it! Free Drinking water also was a serious problem on board costa fortuna , sometimes having bad taste and smell. Thanks to all of them.